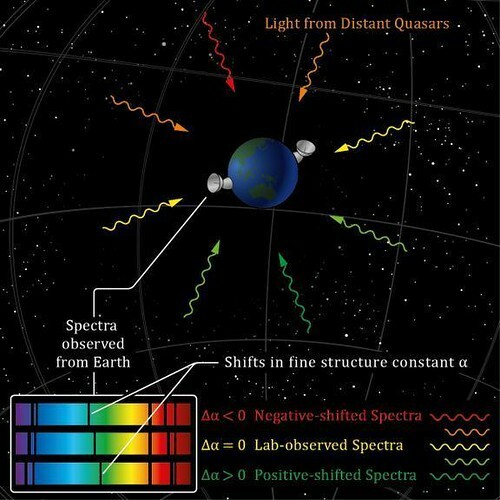 Your "alpha" varies throughout the universe and that means physical laws are different. Just when you thought you’ve got this physics thing worked out, POW: right in the kisser. "After measuring alpha in around 300 distant galaxies, a consistency emerged: this magic number, which tells us the strength of electromagnetism, is not the same everywhere as it is here on Earth, and seems to vary continuously along a preferred axis through the universe," Professor John Webb from the University of New South Wales said. "The implications for our current understanding of science are profound. If the laws of physics turn out to be merely ‘local by-laws’, it might be that whilst our observable part of the universe favours the existence of life and human beings, other far more distant regions may exist where different laws preclude the formation of life, at least as we know it." "If our results are correct, clearly we shall need new physical theories to satisfactorily describe them." We previously reported observations of quasar spectra from the Keck telescope suggesting a smaller value of the fine structure constant, alpha, at high redshift. A new sample of 153 measurements from the ESO Very Large Telescope (VLT), probing a different direction in the universe, also depends on redshift, but in the opposite sense, that is, alpha appears on average to be larger in the past. The combined dataset is well represented by a spatial dipole, significant at the 4.1 sigma level, in the direction right ascension 17.3 +/- 0.6 hours, declination -61 +/- 9 degrees. A detailed analysis for systematics, using observations duplicated at both telescopes, reveals none which are likely to emulate this result. This entry was posted on Tuesday, September 14th, 2010 at 1:27 pm	and is filed under Front Page, Space Tourism. You can follow any responses to this entry through the RSS 2.0 feed. You can leave a response, or trackback from your own site.